Largest poker site in the world by far. Very secure network with reliable payment options. Fast, friendly and helpful customer support available at all times. 50 million+ players worldwide have made PokerStars.com their favourite place to play online poker. No site has more players, more games, and better promotions than PokerStars! Online poker has become so popular in New Zealand that now, just like in many other parts of the world, you have a wide choice in where you can play. PokerStars.com might not be your best bet if you are a rank beginner. But if poker is an activity that you are serious about pursuing in a big way, this PokerStars online poker review should convince you that this is the right online poker room for you to sign up with today. Whether your goal is simply to elevate your skills to the point where you can consistently make a profit, or you are an aspiring pro, you won’t find a better site to do it on than PokerStars. And you can have fun and partake in the social side of poker at the same time. PokerStars was launched all the way back in 2001, but it was in 2003, when amateur player Chris Moneymaker shocked the poker world by winning the WSOP Main Event, that the site really took off. All of the sudden, poker players and non-pokers from all walks of life figured that if Moneymaker could do it, they could do it, and PokerStars.com would be their ticket to riches. 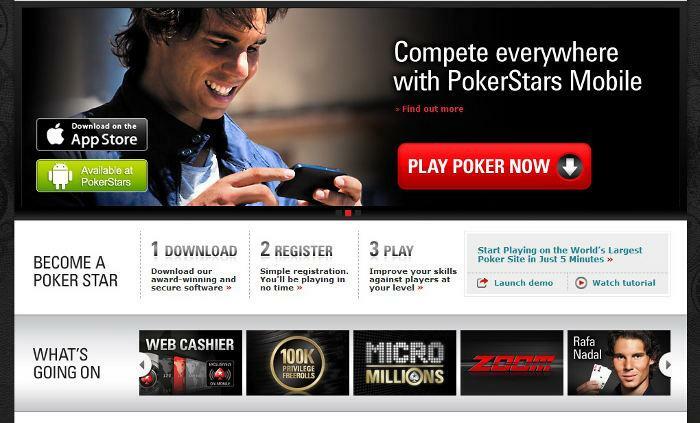 PokerStars became the world’s most popular poker site. 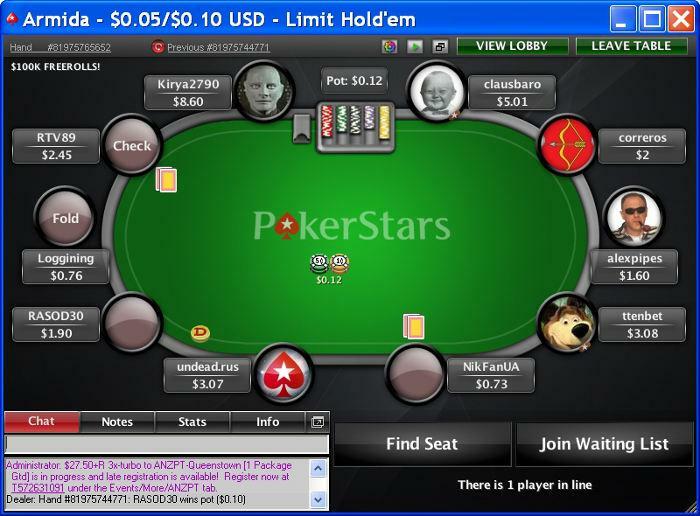 PokerStars, in its early days, was able to offer its games to players in the U.S., but that abruptly ended by order of the U.S. Government on Black Friday (April 15, 2011). Subsequently, the parent company at the time, the Rational Group, was permitted to purchase the assets of another affected poker room (Full Tilt) and send full refunds to the previous American customers on both sites. Unfortunately, despite this settlement, to date, no one from the U.S. can play on either PokerStars or Full Tilt Poker. (Resorts Casino in Atlantic City, NJ has been trying for some time to get its application to partner with PokerStars approved, but the issue is still pending. 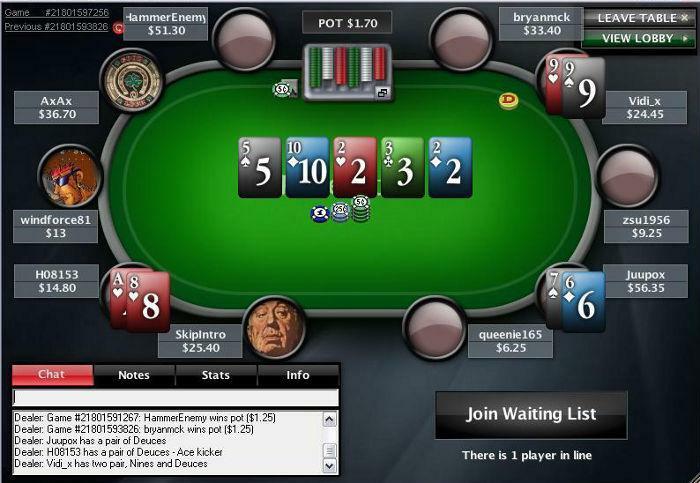 In August 2014, after Amaya Gaming became the new owner of both PokerStars and Full Tilt Poker, it looked like PokerStars would be up and running in the U.S. soon, but that was not the case. The latest report is that PokerStars may finally be able to launch in New Jersey during the fall of 2015, but Caesars Entertainment has now emerged as the most likely partner.) Meanwhile, the good news for you is that you don’t have to wait. New Zealandn players are welcome on PokerStars.com right now, so what are you waiting for? As soon as you sign up as a new PokerStars player, you can start enjoying all of these great features and more. Ranked No. 1 in the world in online poker player traffic. The combination of many thousands of players and a tremendous variety of ‘round the clock cash games, freerolls, and tournaments virtually guarantees finding your game of choice at the stakes you want to play when you want to play. Choice of two reliable and convenient ways to play: downloading the state-of-the-art software onto your computer or playing on the go on your mobile device. The PokerStars.com mobile apps are so technologically advanced that they put the outdated apps of the online poker rooms only offering a handful of games to shame. Mobile players have access not only to all of the same bonuses and promotions and customisable features as computer players, but to all of the same games and tournaments. Exceptionally generous Welcome Bonus offer for new players plus an outstanding tiered VIP program, in which all players reap the rewards. Play for free option in both ring games and tournaments as an alternative to or prelude to playing for real money. Endorsed by world famous poker pros and opportunity to compete against them online. Also, many opportunities to qualify by satellite for bigger tournaments, not only on the site itself, but also offsite in major live events. PokerStars.com hosts the biggest poker tournament on the Internet, the annual World Championship of Online Poker. You can also compete online for a chance to represent your country offline in the World Cup of Poker! *Cannot be used for withdrawal. While the site accepts USD, EUR, GBP, and CAD for deposit, there is no indication that you can use NZD. However, if you have any questions or problems, the Deposit Assistance Department (DAD) offers assistance via live chat in multiple languages. Withdrawal processing time depends on the method, but averages within 72 hours. Regardless of which banking method you select, all transactions are fully protected through the use of advanced encryption technology. 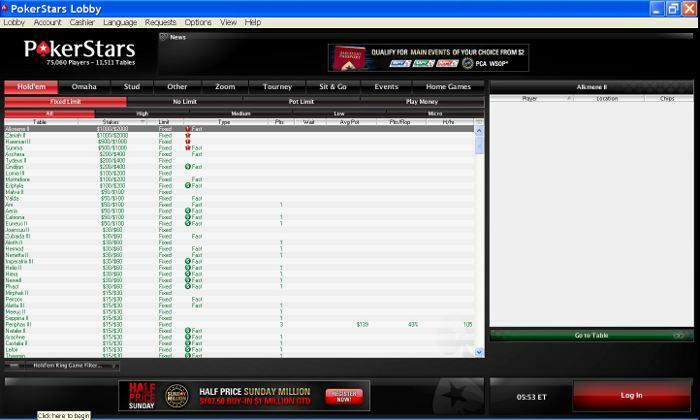 Rather than relying on other software providers, PokerStars.com uses its own proprietary state-of-the-art software. Players have a choice of two reliable and convenient ways to play: downloading the software onto your computer or playing on the go on your mobile device. Surprisingly, there is no instant play flash version, so if you are in a place where you don’t have access to your own home computer, mobile play is your only alternative. However, unlike on most sites, you won’t be missing anything by using the mobile platform to play because everything you can do on the computer, you can also do on your phone or tablet. There are also frequent updates introducing new games and new advanced features to make playing on this site even more enjoyable and exciting. Quick Seating for both ring games and tournaments. Personal avatars and customisable table design. Replay last hand and review hand histories. Search and track specific players. Poker School Online to help you improve your game. Get strategy tips from experts, test your newly learned skills, chat with other players in the PSO forum, and compete for prizes in the PSO Skill League. Anytime you would like to switch from your computer to your mobile device or vice versa, picking up where you left off, you can do so. The Poker Stars iOS app is optimised for Apple iOS 7 or higher devices (iPhones of 4 and above, iPads of 2 and above, and IPod touch 4th Generation and above). The Poker Stars Android app is optimised for Android devices of 4 and above. If have not already registered and set up an account on the computer, you can do so through the built-in web cashier on the app you download onto your mobile device. IPhone and iPad users can download the appropriate app on the App Store; Android device users will find the app for Android phones and tablets on the Pokerstars website. See www.pokerstars.com/mobile for more information. If you are new to mobile poker play, the onsite tutorials specifically designed for handset and tablet users should be very helpful. You can do all of your banking on your mobile device, access bonuses and promotions, review your hand history, track other players, and play any ring game or tournament you please. You can’t ask much more of a mobile app than that! But wait. That last statement isn’t entirely correct because PokerStars.com has launched these additional apps. Poker Stars TV App: Keep up with everything that is happening in the world of poker. Watch poker videos, including live streams, TV shows, clips from major events, and player interviews. You can download the PokerStars TV App on the App store or get it on Google Play. European Poker Tour (EPT) App: If you are planning to play in the EPT, this app, which is also available from the App Store and Google Play, includes everything you need to know. Poker Stars Clock:If you would like to run your own poker tournament from your home and make sure everything goes smoothly, this is the app for you. It is available from the App Store. In summary, our overall PokerStars rating in the software category is outstanding. Despite the technologically advanced software and many customisable options, PokerStars.com is surprisingly easy to navigate Our one criticism of the computer software is the lack of a no download instant play flash version. Our main criticism of the mobile platform is that the apps will presumably only work on iOS and Android devices. Also, multi-tabling and tournament play on a smartphone might be difficult due to the small size of both the screen and action buttons. However, playing on a tablet will solve the problem. As we mentioned at the beginning of this PokerStars.com review, in the category of game variety, no other site in the world comes close to matching the PokerStars rating. If you want to play for free rather than for real money, no problem. If you want to play a game other than Hold ‘Em in the wee hours of the morning on a weekday (forget it even during peak hours on many sites), you can probably find exactly the game you are looking for already in progress and ready for you to join. On PokerStars.com, you can play virtually any game at any time for whatever stakes you want, and that applies to both ring games and tournaments. PokerStars offers numerous varieties of ring games. These are your options. Zoom Poker is the PokerStars version of the fast fold game that has become very popular with online players. As soon as you fold (either in turn or out of turn, you are immediately dealt a new hand at a new table. The Zoom Poker format is offered for low stakes only in both ring games and tournaments. You can even play Zoom Poker heads-up. Otherwise, the quick seat option will have you seated in the game of your choice in no time at all. Pick the game you want to play, specify for play money or real money, whether for a ring game or a tournament, and the stakes you wish to play for. Ring games are offered for Micro, Low, Medium, and High Stakes. In other words, whatever your skill level and bankroll, there should be a game that meets your specifications. Freerolls dispel the myth that gamblers can’t get something for nothing, at least in an online poker room, and at PokerStars.com, you don’t have to wait long at all to start participating. As soon as you join and make your first real money deposit, PokerStars.com will reward you with entry tickets to four $1,000 freerolls every day for 31 days. That’s 124 tournaments! After your first month, you can continue to participate (playing up to four $1,000 freerolls daily), simply by making another deposit or reaching the Chromestar loyalty level. PokerStars.com offers many other freeroll opportunities. Freerolls are not only a risk-free way to have a lot of fun and possibly win a valuable prize, but could qualify you for a seat in a high priced tournament. If you click on the Tourney tab in the lobby or type “Weekly” in the tournament filter, you will find the complete list of all tournaments being offered, which is a long list indeed. While No Limit Hold ‘Em is the primary format, tournaments are also offered in other games like Omaha and Stud. Buy-ins vary greatly, and there are even super-size stack tournaments that give the illusion of being a big tournament except that they use play money instead of real money. Most of the higher prices tournaments give you the option of either buying in directly or trying to win your way in cheaply or for free via one or more qualifying satellites or freerolls. Here are a few examples of tournaments you can play on PokerStars.com. This is the largest weekly poker tournament online with a $1,000,000 guaranteed prize pool every Sunday. The first place prize alone is over $150,000. You can either buy in directly for $215 or win your way in via satellite. The tournament starts at 14:30 ET. Playing in this tournament is exciting, not only because of the huge money at stake, but also because, in addition to PokerStars players like yourself, you get to compete against poker legends and Team PokerStars pros. If you knock out the host, your $215 entry fee is returned to you. If you wish, you don’t have to wait until Sunday evening when the Sunday Million gets underway to start your Sunday tournament action. There are tournaments running all day long from 8:00 ET to 18:30 ET. The biggest of these is the $400,000 Guaranteed Sunday Warmup at 11:00 ET. Or if you are eliminated in the Sunday Million, you can try your luck in in the Sunday Second Chance or Sunday Supersonic. All of these tournaments, like the Sunday Million, have a $215 entry fee. Or, if those entry fees are too steep for you, a good alternative is the $300,000 guaranteed Sunday Storm which starts at 13:30 ET with a buy-in of only $11. Every day the site offers more tournaments with huge prize pools. Buy-ins range from $2.20 to over $100. This is a Hyper-Turbo Sit & Go tournament for 3 players only with an opportunity to win up to 3,000 your buy-in a matter of minutes. (The prize pool is randomly determined by a spinner in the center of the table.) The odds are that the multiplier will be much less, i.e., 2x the buy-in, but nobody walks away empty-handed, as there is also a token payout for the 2nd and 3rd place finishers. Buy-ins range from $1 to $100. In addition to the Spin & Go, you can choose from a wide variety of other Sit and Go and turbo tournaments. PokerStars has more women players than any other site, so it only makes sense that they have more women tournaments than anywhere else. The biggest of these is the $55 buy-in $7,500 guaranteed tournament every Sunday. Otherwise, the emphasis is on small stakes tournaments and social games. -	World Championship of Online Poker (WCOOP), including a $10,000 Guaranteed Main Event. The 2015 WCOOP gets underway in September. -	World Cup of Poker: The action starts on 11/22/15 so you still have time to try to qualify online. New Zealand is one of the 96 countries represented. What a fantastic honor it would be to take home the World Cup for your country! See the website for the complete details. Playing on a site with high traffic is highly desirable for several reasons. First, it is as good assurance as any that players like the site and feel they are being treated fairly. Second, you never have to settle for shorthanded games or not finding the game you want to play. PokerStars.com has more players than any other site. PokerStars.com has so many players, in fact, that during peak periods like the Sunday Millions Tournament, the site can be so crowded that service will be slow. Another problem, if you are a novice or intent on finding soft games with easy-to-beat casual recreational players, is that except for the micro stakes games, you won’t find many fish in these waters. The higher stakes games attract many pros and semi-pros, but this site is also loaded with serious players and tough to beat grinders, even at relatively low stakes. Customer Support is available to all players 24/7 via live chat and email, but not by phone. All new real money players, including mobile players, can take advantage of a generous Welcome Bonus. You have 60 days to make up to three deposits totaling up to $600. The bonus consists of 100% of your qualifying deposit(s). For every $1 you contribute to the rake in ring games or pay in tournament fees, you earn 5.5 VIP Player Points (VPPs). Then, for every 200 VPPs earned, $10 of the bonus is released. You have 4 months to earn enough VPPs to clear the bonus. If you wish, you can deposit less than $600 and take a smaller bonus. Or, alternatively, simply deposit $20 or more to receive $20 in free play. However, as soon as you are ready to make your first deposit, you need to pick which of the two bonuses you want. In addition to the bonus, as mentioned earlier in this PokerStars review, all new players automatically receive an invitation for the $100K Privilege Freerolls (up to four a day for 31 days). There are two types of player points you earn at PokerStars.com. Frequent Player Points (FPPs) are redeemable points based on play which you can use to enter tournaments, buy merchandise from the VIP store, or exchange for cash. VIP Player Points (VPPs) are non-redeemable points which determine your level in the 7-tiered PokerStars VIP Club. Everyone starts on day 1 at the Bronze Star level, but with the opportunity to advance based on play. The higher levels are Chrome, Silver, Gold, and Platinum Star and two ultra-high levels, Supernova and Supernova Elite. Each time you earn one VPP, you earn one or more FPPs based on your level. Each next level has a certain minimum number of VPPs that must be earned and maintained each month (or year for Supernova and Supernova Elite). The higher your level, the faster you earn points towards rewards and the bigger your rewards. All players are entitled to monthly rewards and an end-of-year Stellar Rebate. The latter can range from $10 for players with 750 VPPs all the way up to $1,200 for players with 100,000 VPPs. However, higher tier players are also invited to exclusive VIP tournaments just for players at their level and higher. Supernova and Supernova Elite players receive the highest level of benefits, including personal concierge service prioritized support, live event packages and benefits, a Porsche Cayman S, massive bonuses throughout the year, and VIP yearly milestone rebates. Even though the history of PokerStars.com has not been all smooth sailing, the site is to be commended not only for its ability to bounce back from adversity in a big way, but also for its commitment to do right by its players. The fact that PokerStars.com has been operating successfully online since 2001 should in itself convince you that this is a safe and secure place to play and that all of the games are fair. Frequent reviews by independent auditors along with the endorsement of highly respected internationally known poker pros provide additional assurance of the integrity of the site. No online poker room in the world, including this one, is perfect, so this overwhelmingly favourable PokerStars online poker review would be incomplete without also mentioning a few areas which could be improved for an even higher PokerStars online poker rating. No U.S. players allowed. That may change soon. At least we hope so. No non-downloadable instant play flash version. Customer complaints of slow service during peak periods due to overloading. Give due respect for the fact that many women are excellent poker players and would welcome the opportunity to play in more competitive tournaments for higher stakes that properly reward their skills. Despite the beginner friendly features like low stakes games and an online poker school, PokerStars.com is still much more geared for skilled players. Perhaps a special portion of the site with games that would be less intimidating to rank beginners would help. Develop new apps that support play on other mobile devices, not just IOS and Android devices. Customer Support is limited to live chat and email. 24/7 phone support needs to be added. Our overall PokerStars online poker rating places this site as among the very best. Out of all the places where you can play poker online, PokerStars.com is unsurpassed in the tremendous choice of both ring games and tournaments, including games to fit every budget and playing style preference. However, keep in mind that this site is designed more for serious players than casual recreational players. If you are brand new to poker and/or only intend to play occasionally, this might not be the best site for you. On the other hand, if you are seeking to hone your skills and challenge yourself to meet new milestones and hopefully win serious money, this could be the perfect site for you. Be careful not to overdo it though. With the constant overload of activity, it can be easy to get so caught up in the action that you leave no time in your schedule for anything but poker. If you can exercise the proper restraint, the opportunities for fun and profit on PokerStars.com are limitless. play now Get a 100% bonus at the world’s biggest poker site!